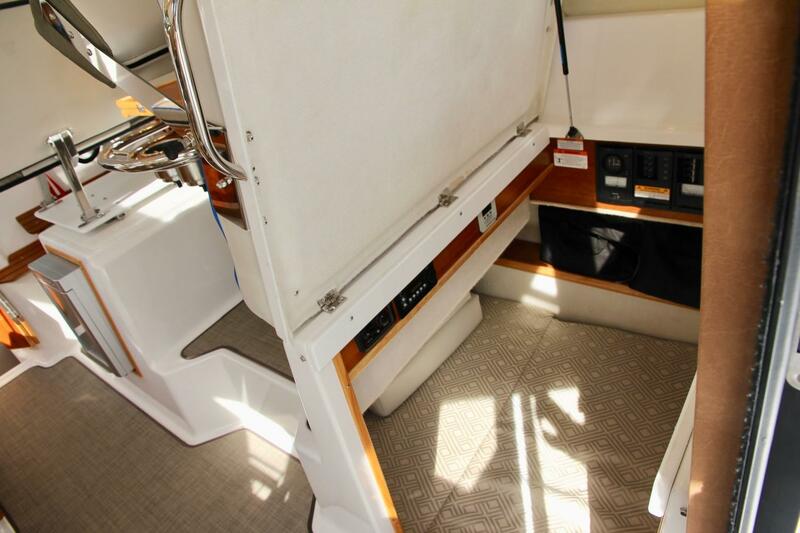 Shed kept and dealer serviced, this Cutwater is in tip-top condition. 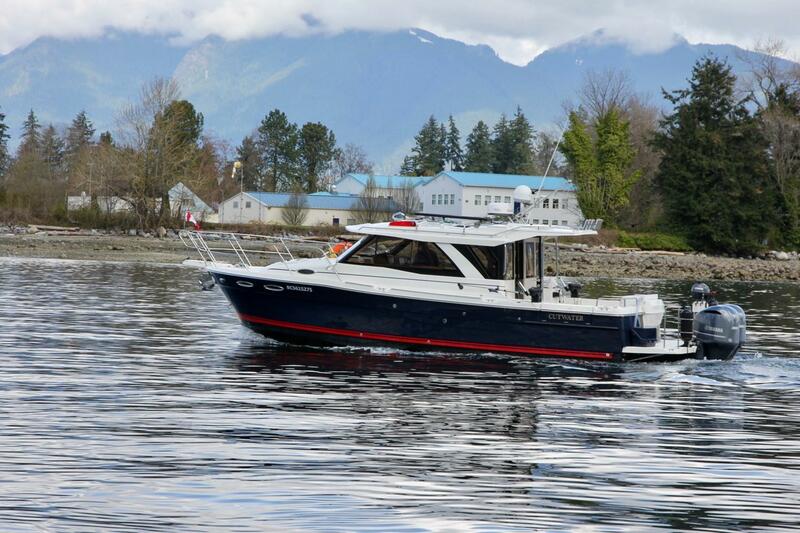 She is a super-fun boat that is loaded with options. 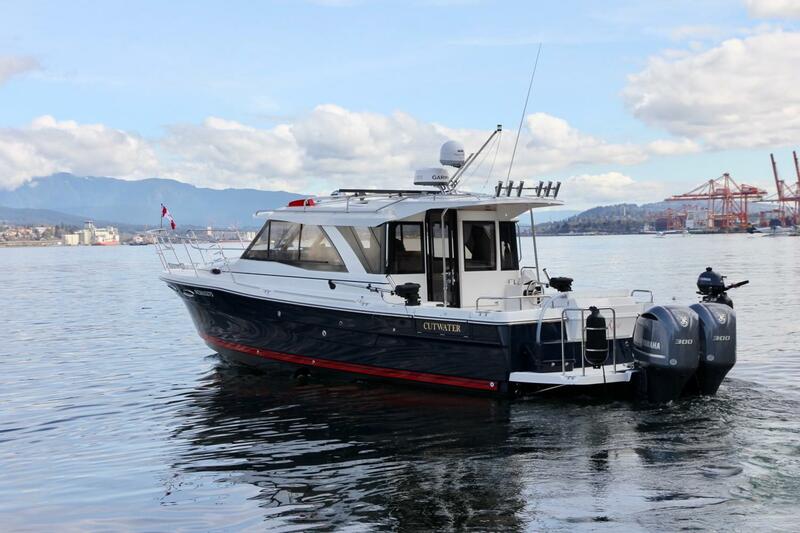 An innovative blend of fishing and cruising. 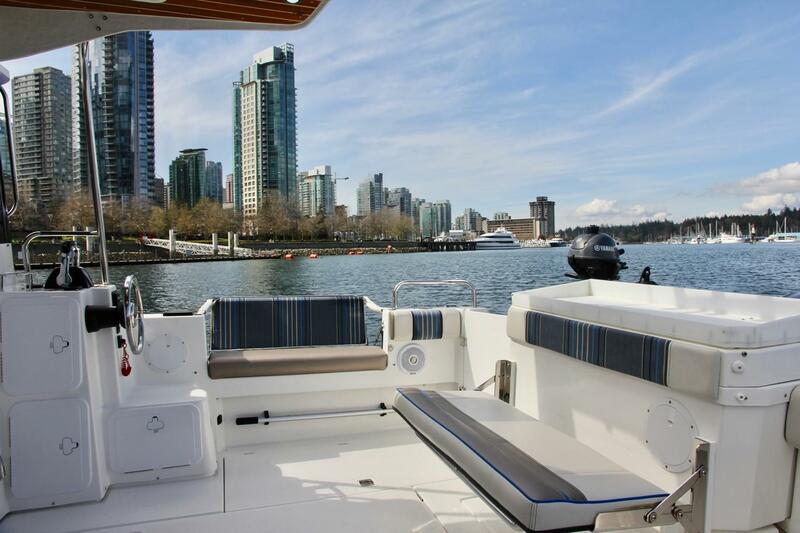 On our Vancouver docks and ready for the season! 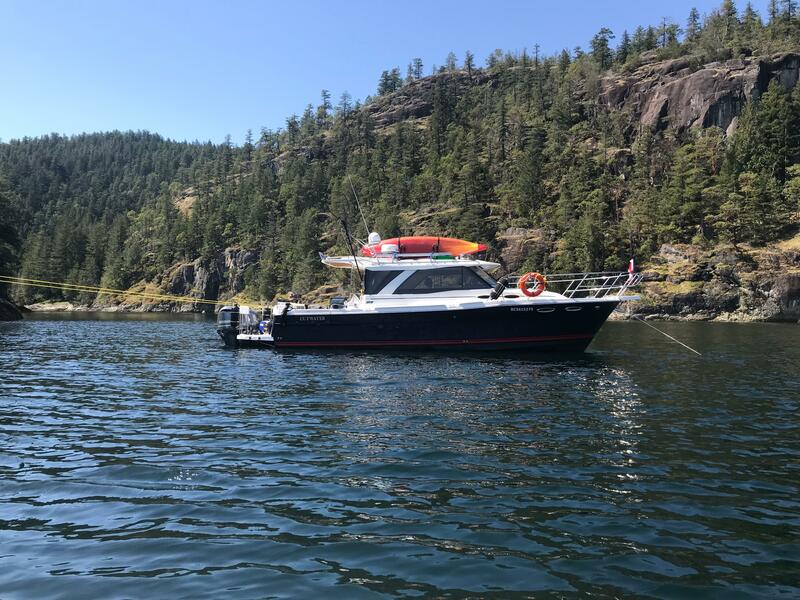 This is a wonderful boat with all the essentials a cruising couple or fishing family could want in 30 feet: an impressive standard equipment list, all the right options, thoughtful and unique living spaces, and great performance. 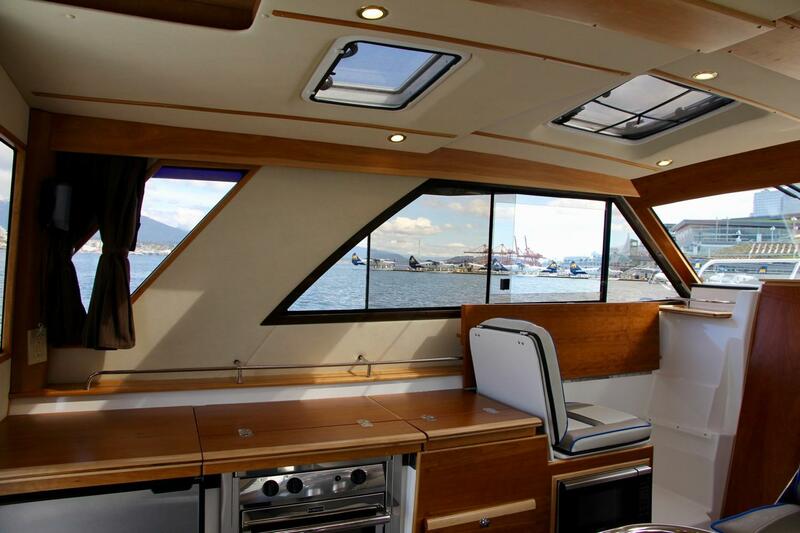 "A masterpiece of innovation that ensures unsurpassed enjoyment, year after year." 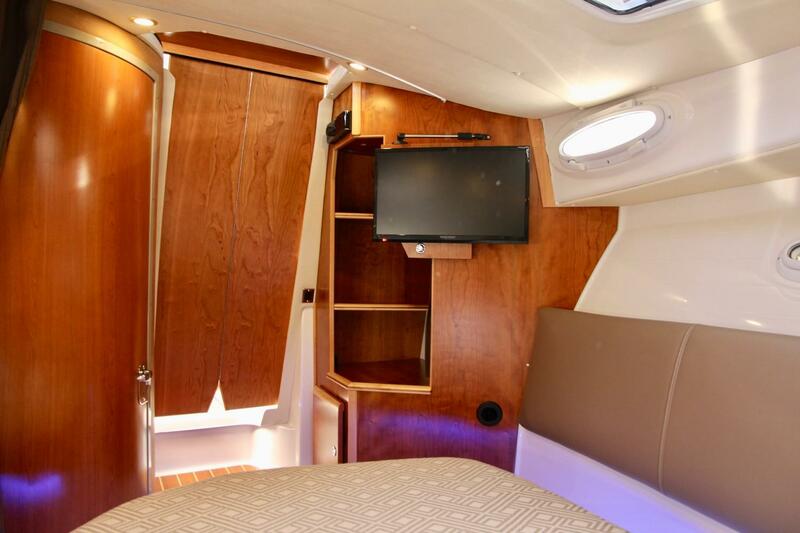 Sleeping accommodations are in a private cabin forward, a mid cabin under the salon, and in the salon table, where the table drops and converts to a berth. 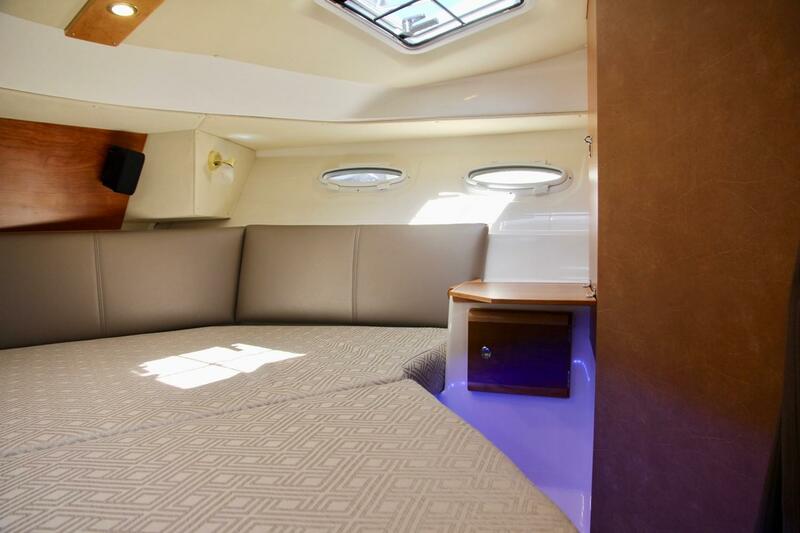 Under the salon settee is the mid-cabin with a 6' 8" berth, two portlights, lights and gear storage. 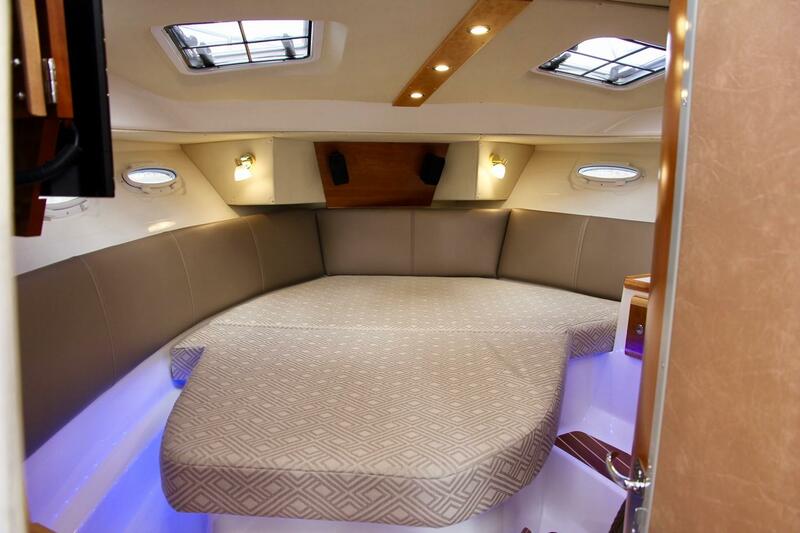 Settee to starboard with fore and aft facing benches. 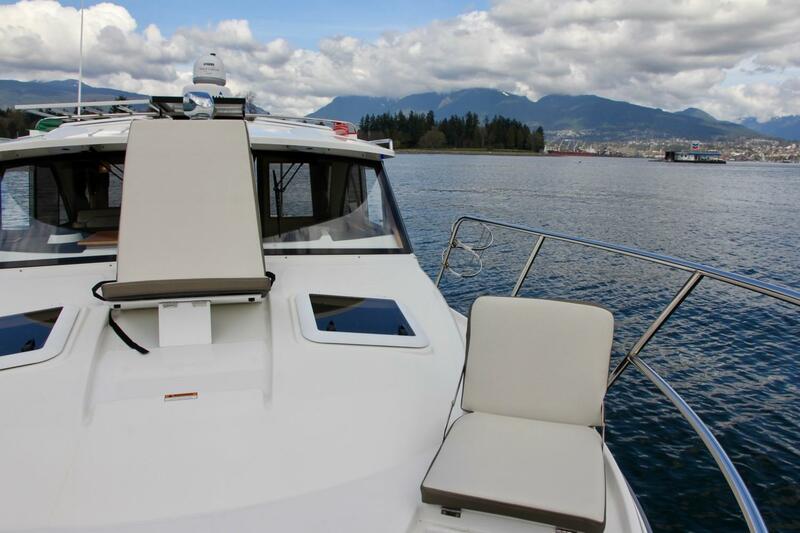 These benches have backrests that convert to allow guest to sit facing either way; across from each other, aft to the cockpit through the opening bulkhead, or facing forward with the bench helm seat. 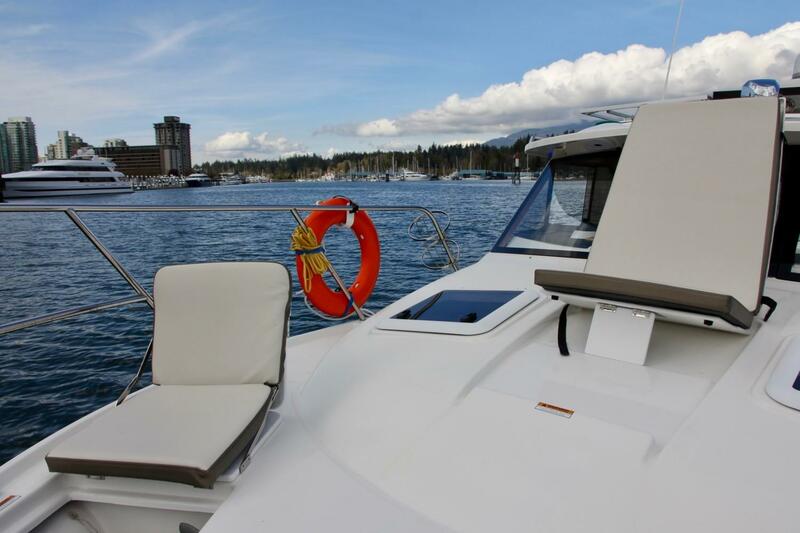 The large hi-lo table converts to a berth if needed. 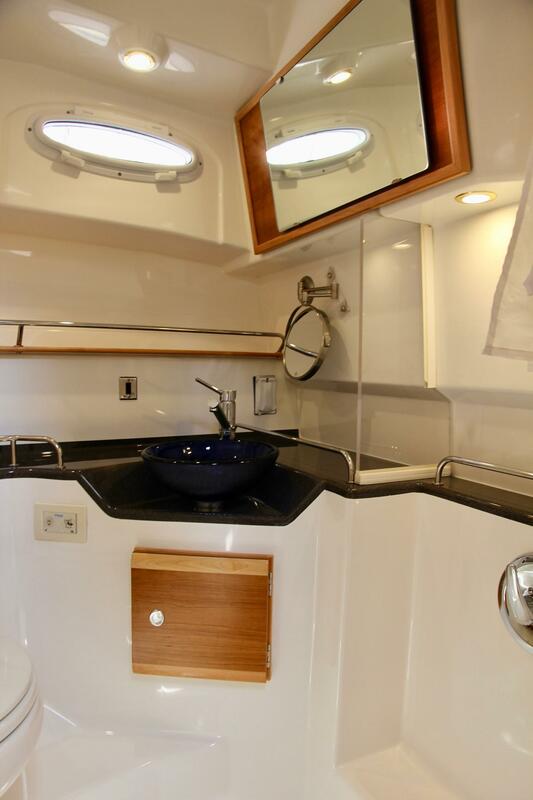 The Euro-style galley is to port with superb working surface and great storage in numerous lockers and drawers. 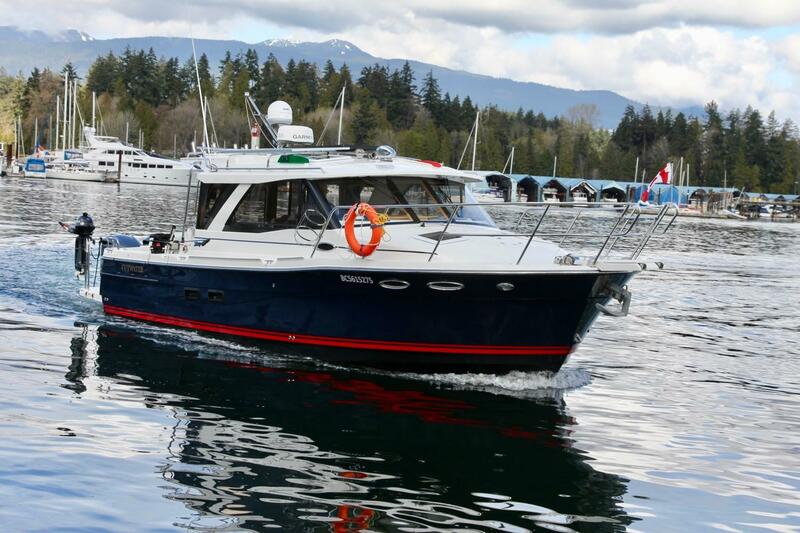 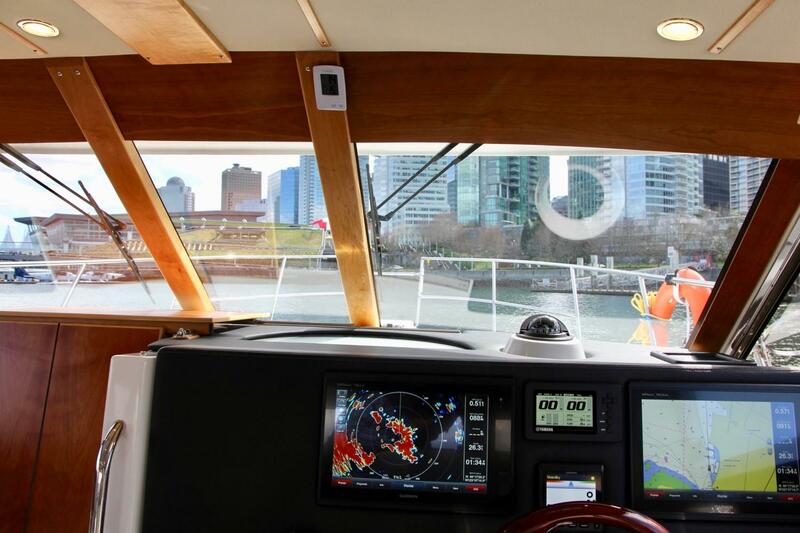 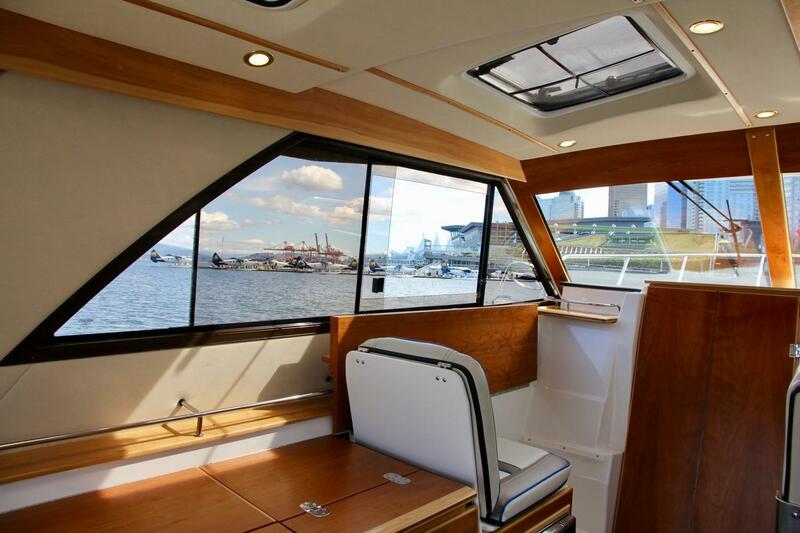 The helm is forward to starboard with a bench seat for two, with dual level foot rests. 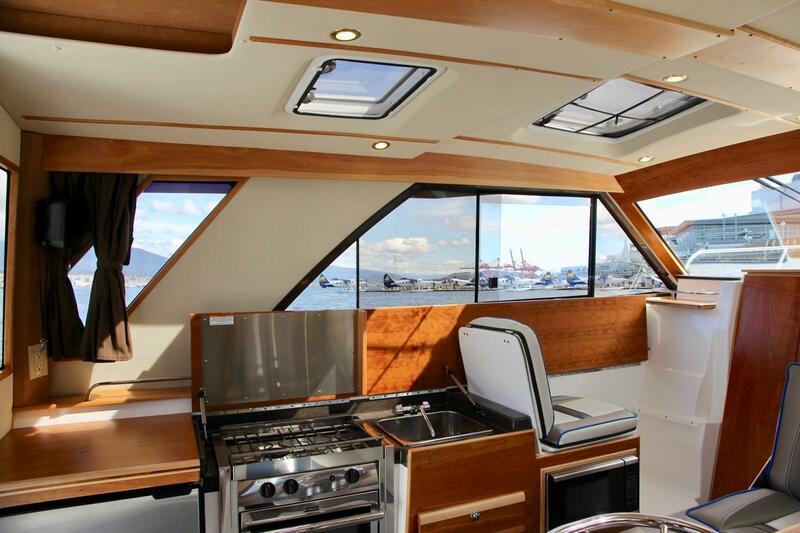 Board via the opening transom door from the swim platform. 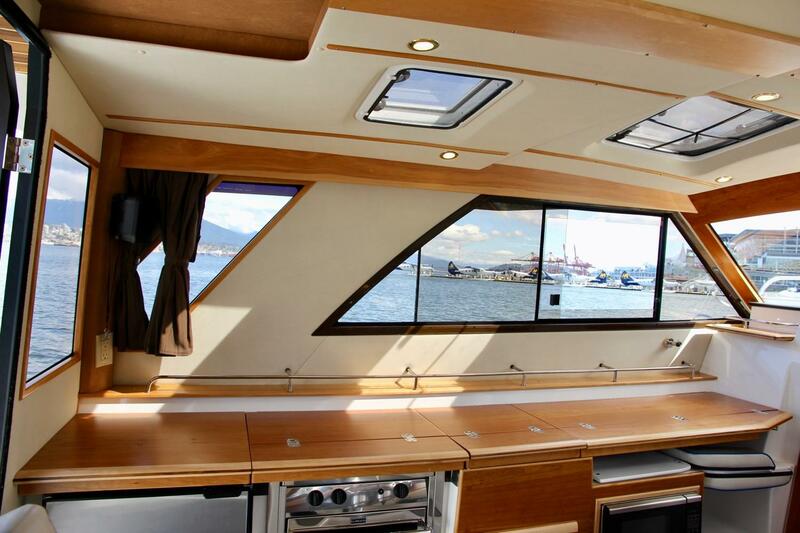 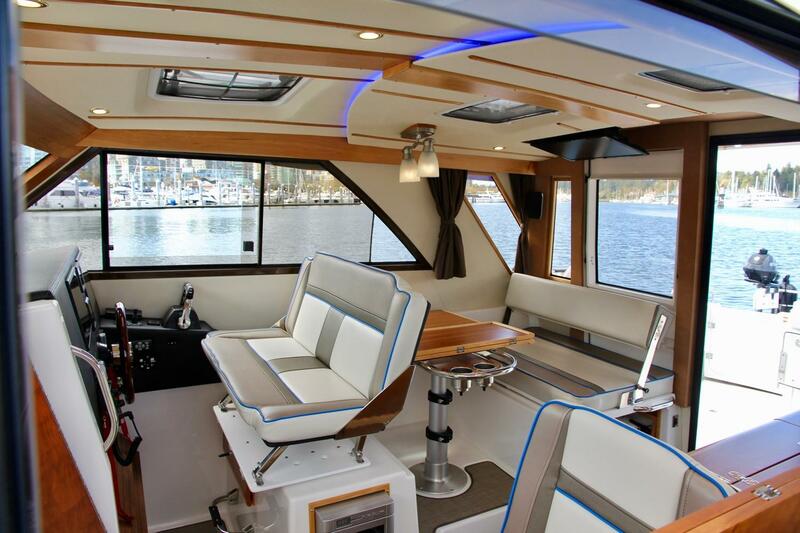 The cockpit has large square footage for fishing and ample seating all around for lounging and entertaining. 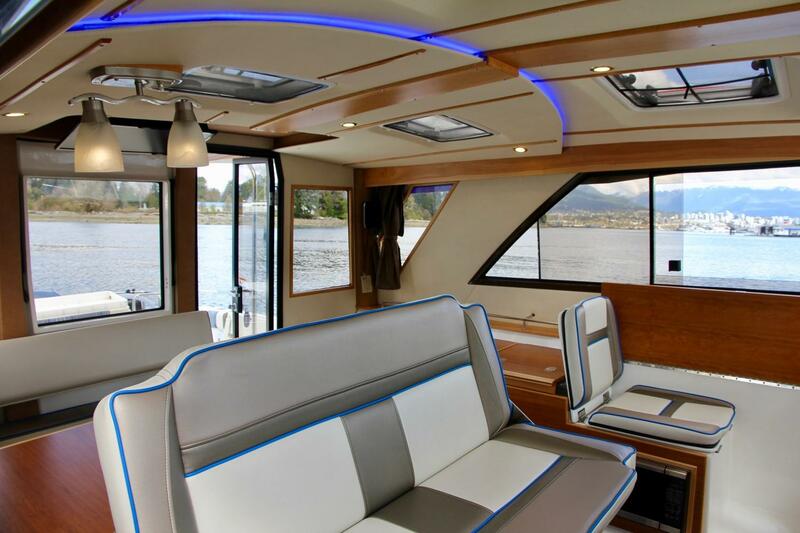 The aft bulkhead to the salon opens up to incorporate salon seating to the cockpit seating. 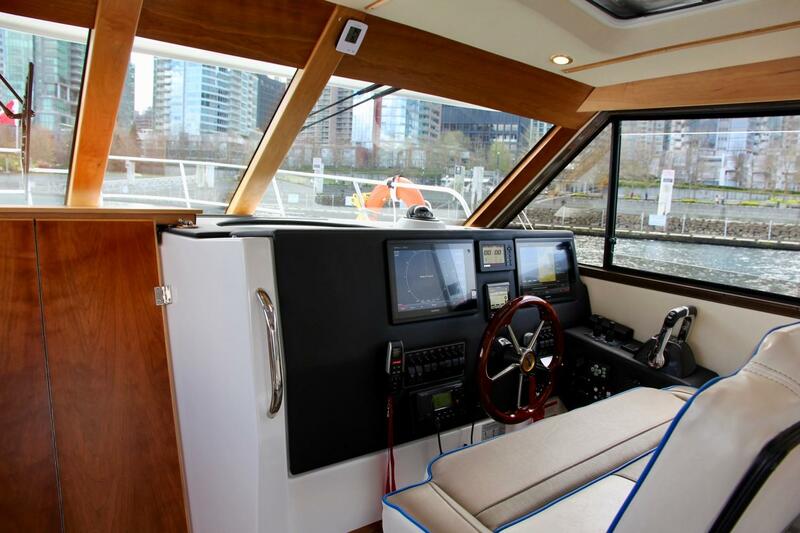 And the cockpit is protected by a partial hard top cover with two opening overhead hatches. 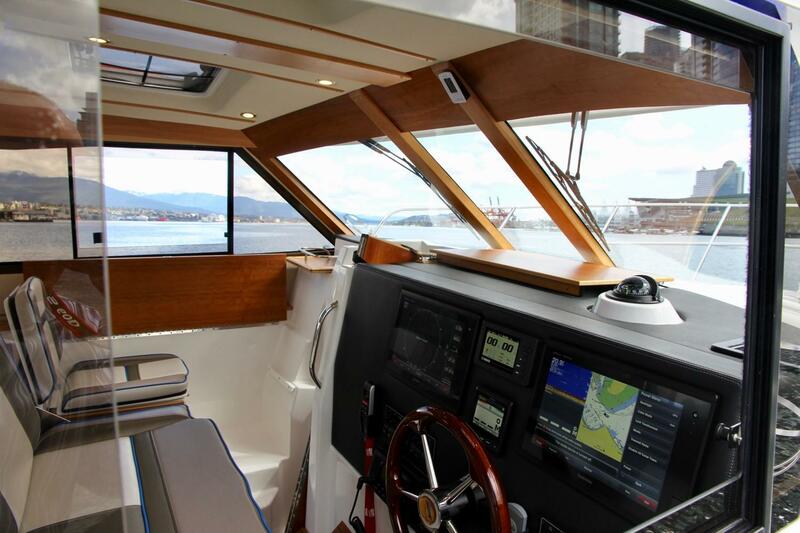 On both port and starboard, steps up lead to the side decks and foredeck. 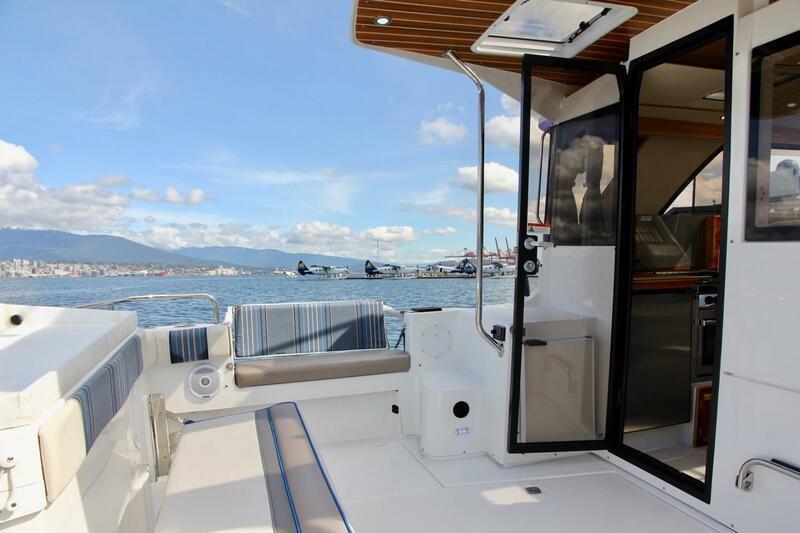 Electrical DC power services the vessel systems via a large battery bank and AC service is via shorepower, or when away from the dock, the inverter. 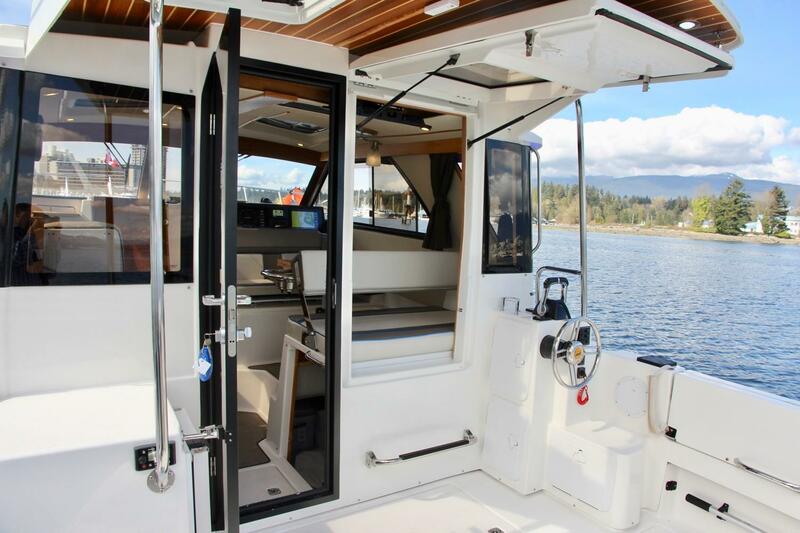 Power by twin Yamaha V6 4.2L 300 hp outboard engines - known for quiet, efficient and reliable operation with superb support throughout BC. 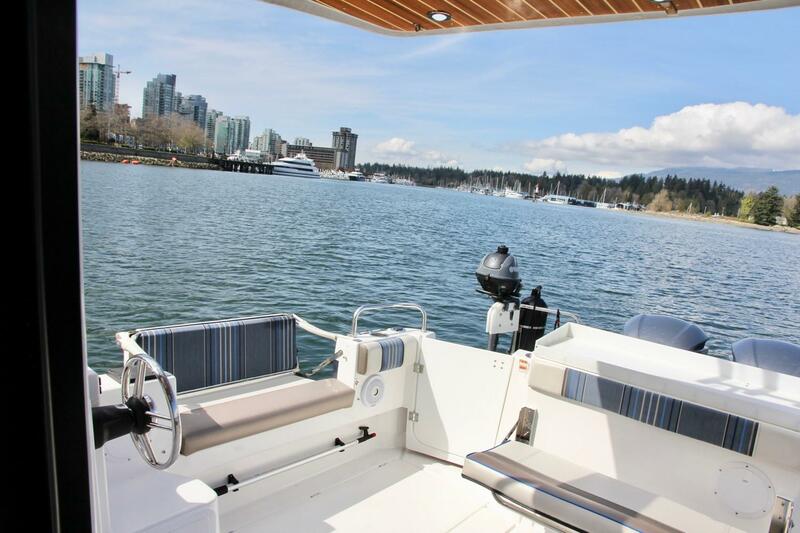 The AC hot water tank has had an interesting and very useful custom upgrade: Normally, hot water is only available when plugged into shore power. 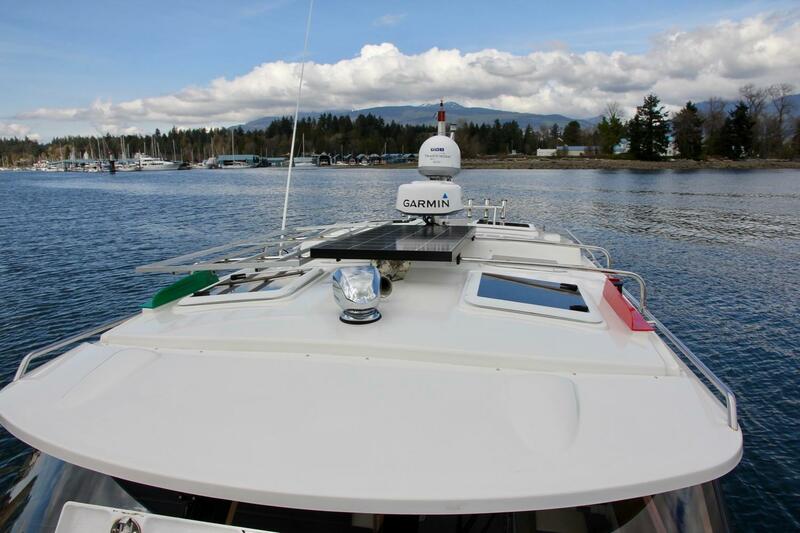 However, on this boat, the hot water tank is also wired through the inverter and two additional batteries were installed so hot water can be produced while underway. 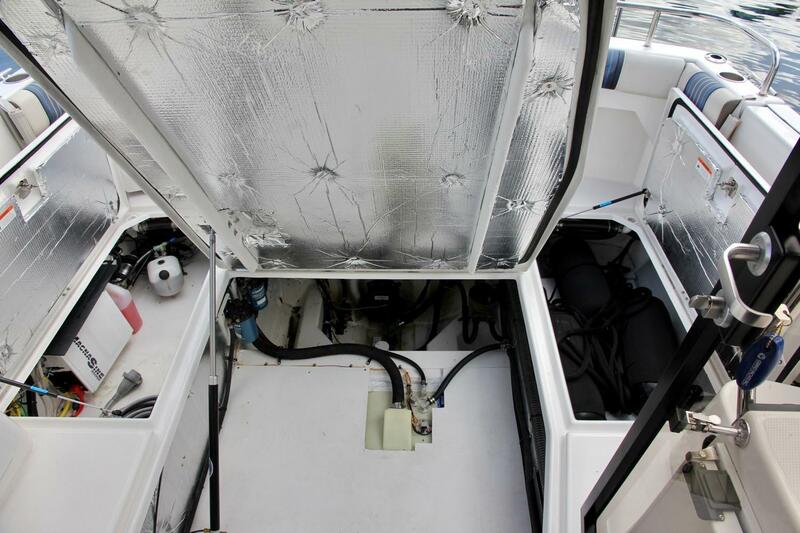 While the inverter is powering the hot water tank, the engines are keeping the batteries topped up. 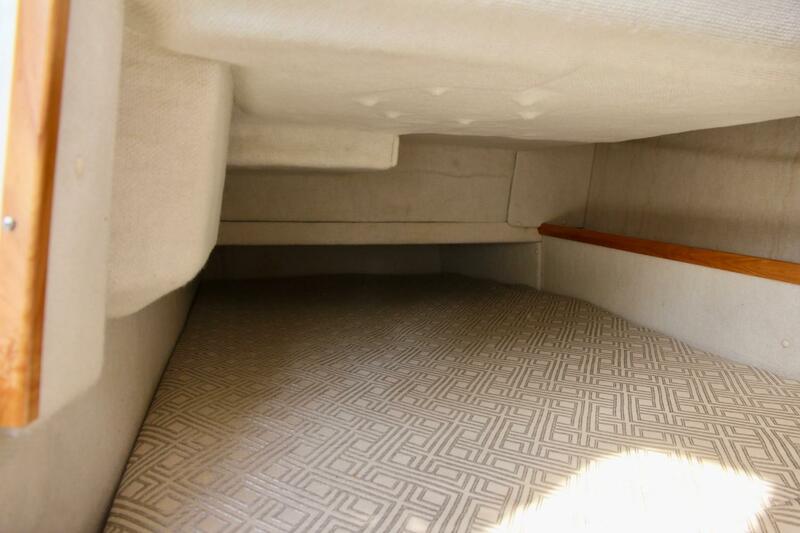 An aluminum triple axle trailer with electric / hydraulic brakes and spare tire with bracket is available for separate purchase. 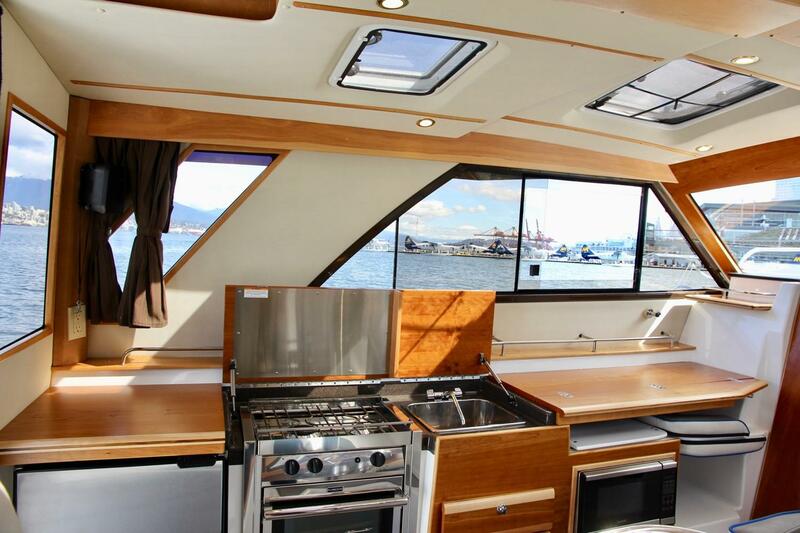 Price is $15,000 CAD. 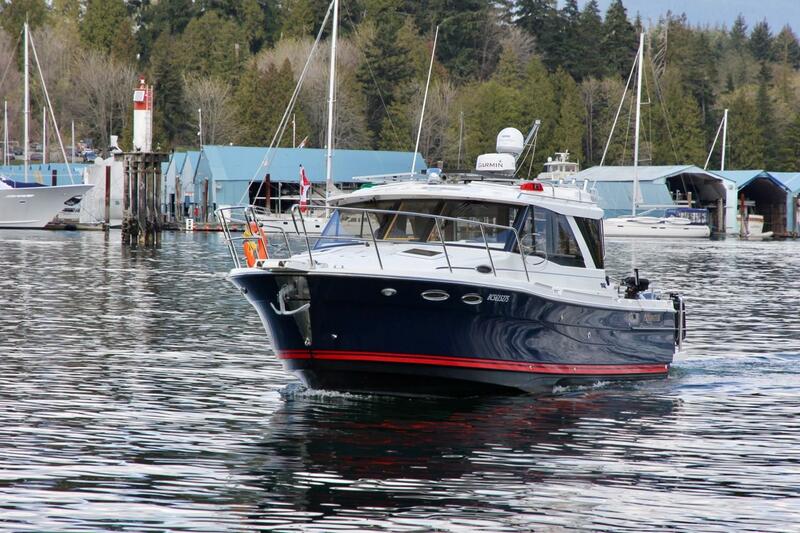 Hi there, I would like more information about the Cutwater 302 Coupe.